MADISON, WI (November 3, 2017) — To raise funds to help areas in the Caribbean devastated by Hurricane Irma, Ideal Credit Union, in partnership with the Worldwide Foundation for Credit Unions, launched a two-week drive from October 6-20, 2017, to encourage donations from members, employees and the community at large, and pledged to match up to $2,500 of the money collected. In two short weeks, not only was the goal met to raise $2,500, but more than $5,000 was donated to support Caribbean relief efforts. 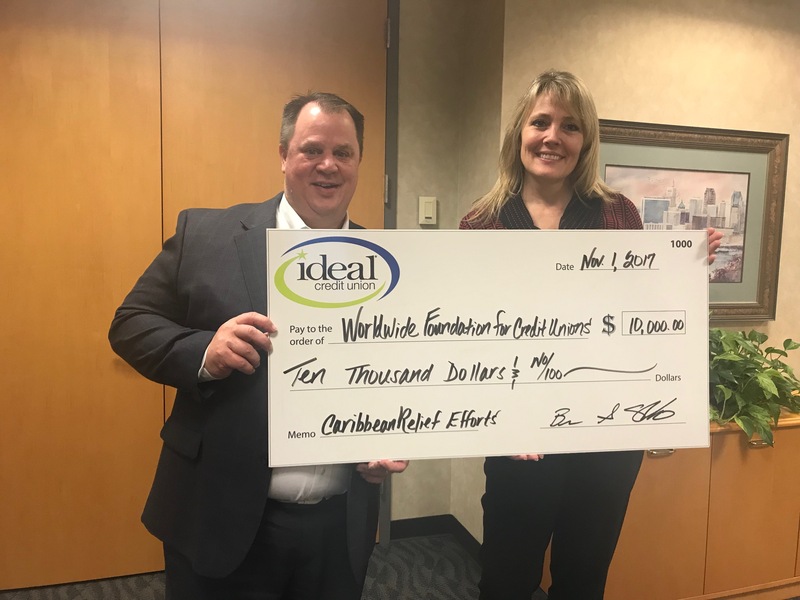 At its October meeting, the Ideal CU Board of Directors voted to double the match to $5,000, resulting in a $10,000 donation to the Worldwide Foundation for Credit Unions, which is the official fundraising arm of the World Council of Credit Unions. Credit unions in the Caribbean and their 100,000 plus members have suffered significant loss and the World Council has pledged to provide immediate relief to support rebuilding efforts. In September, Ideal CU employees rallied internally to collect donations to purchase cleaning supplies for victims of Hurricane Harvey in Houston, Texas. The Ideal CU Board of Directors again matched the amount raised, and $2,000 was sent to help fill a trailer worth of brooms, mops, sponges and more. Ideal CU President/CEO Brian Sherrick and EVP of Operations Alisha Johnson proudly pose with an oversize check representing the $10,000 donation the credit union made to the Worldwide Foundation for Credit Unions for Caribbean relief efforts.